Preventing the infection transmission has been considered an important topic in dentistry for many years, especially by increasing awareness of the cross-contamination with hepatitis B and human immunodeficiency viruses. Cross infection to dental staff can often occur due to the existence of microorganisms from patient's blood and saliva on dental tools as well as patient's oral impressions.,,, Since the impression and other prosthetic materials are the main sources that can potentially transfer the microorganisms from the patient's mouth to dental laboratory, they should be rinsed thoroughly and disinfected before delivering to the laboratory.,,,,, The impression can be disinfected through immersion or spraying with a disinfectant. The immersion method is more effective , in eliminating the microorganisms, but the spraying method reduces the distortion of the impression.,, Rinsing with water alone is not adequate for removing the oral pathogens. Moreover, it has been shown that this treatment may increase spreading a significant number of remaining bacteria over the surface of the impression material. A variety of disinfectants were recommended for impression materials.,,, These disinfectants should be compatible with the available materials and have no adverse effect on the dimensional stability and surface details of the impression. The irreversible hydrochloride material is a common impression material in dentistry. However, according to its composition, texture, and hydrophilic setting mechanism, this material can easily get contaminated compared to the elastomeric impression materials., The common disinfection solutions for hydrochloride impression materials are glutaraldehyde and sodium hypochlorite. However, using disinfecting solutions may result in dimensional changes of dental impressions, and there are some questions regarding the potential health risks of these disinfectants for the dental personals. One of the various ways of using ozone in dentistry includes removing the microorganisms from dental unit water lines, the oral cavity, and dentures. Ozone is also successfully used as a prophylactic agent before etching and the placement of dental sealants and restorations.,, Antibacterial effect of ozone on Staphylococcus aureus in ultrasonic cleaning system has produced appropriate results. The aim of this study was to evaluate the preventive role of ozonated water in infection control with disinfection of irreversible hydrocolloid impression material. In this experimental study, 32 discs (1 cm diameter and 2 mm thickness) of irreversible hydrocolloid impression material (Alginoplast, Heraeus Kulzer, Hanau, Germany) were made. The impression material was mixed according to the manufacturer's instructions. Circular metal molds (1 cm wide and 2 mm thick) were used to create the specimens. The molds were placed on a glass slab, and the impression material was injected into the molds. Then, a second slab was inserted on top. The glass slabs, spatula, and metal molds were disinfected with 70% ethanol. After setting of the impression material, the discoid impression specimens were removed. To ensure that there is no contamination, two samples were assigned as a negative control and evaluated. In this study, two bacteria including Pseudomonas aeruginosa (ATCC 27853) and S. aureus (ATCC 51299) and one fungi Candida albicans (PTCC 5027) (Biomark Laboratories, Pune, India) were used. Stock culture was prepared from the bacteria and fungi samples. In this protocol, samples of S. aureus and P. aeruginosa were cultured for 24 h and C. albicans for 48 h in the Brain Heart Infusion Broth. The result was a thick suspension, which was then irrigated with physiologic serum and centrifuged at 4000 RPM for 5 min. The number of bacteria was estimated at 1.5 × 108 and C. albicans at 1 × 106 per ml. For preparing McFarland 0.5, we used 625 nm on a spectrophotometer and optical density of 0.01. 0.5cc (500 λ) of microbial suspension was transferred to small sterile tubes (121°C, 15 min, 115 Psi) through sampler. For each microbial species, 12 tubes were considered and one circular sample of impression material was placed in each of the tubes (five samples for each immersion time and 2 for control). Then, the tubes were incubated in 37°C. Based on pilot tests, the best period of time (incubation time) for exposing the specimens to bacteria to achieve maximum attachment to impression material was 60 min. Trypsin was used to separate microorganisms from the specimens. The specimens that were contaminated with P. aeruginosa, S. aureus, and C. albicans were tested as a pilot study to find the best trypsinization time. After contamination for 30, 60, and 120 min with bacteria and fungi, they were exposed to trypsin for 30, 60, and 120 min. Following culturing of the solution from the trypsinization, the number of colonies was calculated. With these pilot studies, the basic method for exposing the samples to microbial suspension, appropriate concentration of trypsin, and incubation time and temperature were designated (60 min for exposing the samples to microbial suspension and 120, 60, and 30 min for trypsinization for P. aeruginosa, S. aureus, and C. albicans, respectively). The disinfectant was ozonated water produced by ozone-making device (Anyzone Gold: Bionics, South Korea) with flow of 200 ppm/min. Specimens were first irrigated with water to assimilate clinical procedure. An ozone tube with a sterile sampler head was positioned in the sterilized tubes containing 50 cc sterile water and contaminated samples. Ozone tubes were adjusted to the same height in each tube. Then, the ozone making device was turned on. Disinfection time with ozone was 5 and 10 min (5 samples each). Specimens were put in 1 cc trypsin (37°C) 120, 60, or 30 min according to pilot tests. Impression materials pieces were removed, and the remaining suspensions were diluted to concentrations that the number of colony-forming units (CFUs) was countable (1/4 for P. aeruginosa, 1/16 for S. aureus, and 1/8 for C. albicans). These dilution concentrations were calculated with consecutive dilution from 1 to 1/32 for each microbial suspension. The Mueller Hinton Agar and Sabouraud Dextrose Agar (Merck, Darmstadt, Germany) were used to culture the studied bacteria and C. albicans, respectively. Fifty λ of each diluted microorganisms were introduced onto the surface of each agar plates individually. The number of CFUs was counted after incubation of plates at 37°C for bacteria (24 h) and fungal strains (48 h). The mean CFU for each group was calculated. Two-way repeated measure ANOVA was used for assessing significant differences of disinfection time. Scheffe post hoc test was used for pairwise comparison of CFUs before and after disinfection for each microorganism. A significant level of 0.05 was used for statistical analysis (α = 0.05). 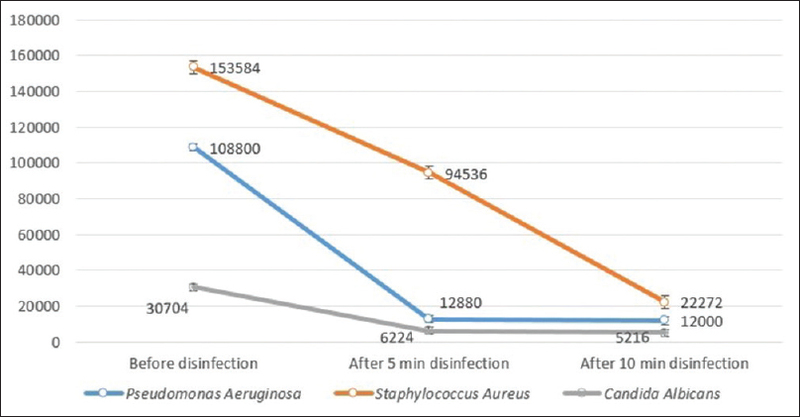 [Table 1] and [Figure 1] show the mean CFU count of the studied microorganisms before and after disinfection with ozonated water for 5 and 10 min (F = 2078.13; P < 0.001). Disinfection of specimens with ozonated water reduced the number of P. aeruginosa, S. aureus, and C. albicans to 11.84%, 61.55%, and 20.27% (after 5 min) and 11.03%, 14.50%, and 16.99%, respectively (after 10 min). Two-way repeated measure ANOVA showed that disinfection time significantly affected the number of CFUs (F = 2078.13, P < 0.001) [Table 2]. In addition, the studied microorganisms were significantly different in the amount of attachment to the impression material. S. aureus had the highest and C. albicans had the lowest attachment to impression materials (F = 401.6, P < 0.001). The interaction between disinfection time and type of microorganism showed a significant effect (F = 359.62, P < 0.001). Scheffe post hoc test showed that there is significant difference between the CFUs count before and after 5 min disinfection with ozonated water for all studied microorganisms (P < 0.001), whereas the difference between CFUs count after 5 and 10 min disinfection was only statistically different for S. aureus (P < 0.001) and P = 1.00 for P. aeruginosa and C. albicans [Table 1]. Controlling the risk of bacteria and viruses transmission between dental clinic and laboratory by dental impressions and other prosthetic works have gathered the attention of clinic and laboratory staff. To reduce the probability of cross contamination, disinfection is recommended as a part of clinical guides. However, such recommendations have been somewhat neglected and even when taken into consideration, their effects were limited due to using wrong methods. Because sterilization with heat is not an option for dental impressions and occlusal records, chemical disinfection is still the method of choice for decontamination of microorganisms. In the present study, ozonated water was used as a disinfectant. P. aeruginosa (ATCC 27853) and S. aureus (ATCC 51299) and C. albicans (PTCC 5027) were the chosen microorganisms for this study. A negative control was assigned to ensure that the specimens were not contaminated earlier. For evaluating the amount of microbial attachment, various methods exist such as trypsinization, use of ultraviolet rays, sonication, and shaking the specimens. Pilot tests were done to standardize the method of study and best time and concentration for trypsinization and incubation temperature were identified. After cultivating bacteria in a solid environment, their growth is haltered for a short period of time (lag phase). This helps the bacteria adapt to their culturing environment. This period is 1–2 h for a fast reproducing bacterium. For this reason, counting the bacteria is done after 24 h. For C. albicans, due to the slow pace of growth, the counting is carried away after 48 h.
Results of this study showed a significant decrease in a number of colonies compared to control group after immersion in ozonated water for 5 and 10 min [Figure 1]. Only the number of S. aureus colonies significantly differ in 5 and 10 min time periods (P = 0.001). In addition, it does not seem that prolonging the disinfection time would cause more decrease in bacterial count. This is probably due to structural diversities between microorganisms. This study showed that even though disinfection with ozone solution for 5 and 10 min decreased the microorganism's counts, it did not eliminate them completely. In other words, concentration of 200 ppm/min ozone is not able to completely disinfect the irreversible hydrocolloid impressions. In clinical situations, probably the number of microorganisms existing on the impression after removing from the mouth is much less than that of our study. Sofou et al. reported that the maximum number of microorganism on the surface of impression materials is 3.4 × 104. Furthermore, exposure time is around 3–5 min, which is obviously less than this study. Hence, in clinical situations, it might be enough to reduce the microbial count to a level that is no longer pestiferous. In a study done on disinfection effect of ozone on C. albicans attached to acrylic dentures, a decrease in the number of fungi was dependent on disinfection time in a way that after 10 min, their amount reduces to approximately 0.1%, but it did not reach zero. In this study, 200 ppm/min ozonated water was used to disinfect the irreversible hydrochloride material. It may be more effective if a higher concentration of ozonated water is used. In addition, the present study was done on three types of microorganisms, and considering the various types of microorganisms that reside the oral environment, it would be advantageous to do a clinical study as well. Despite the limitation of this study, it can be concluded that immersion in ozonated water can reduce the number of microorganisms on the surface of irreversible hydrocolloid materials and increasing the time of immersion increase the disinfection efficacy of ozonated water. This study was approved by the Ethics Committee of Isfahan University of Medical Sciences and supported by Isfahan University of Medical Sciences (Research Grant No. 185207). Based on a thesis submitted to Torabinejad Dental Research Center and the graduate school of Isfahan University of Medical Sciences in partial fulfillment of the requirement for the Doctor of Dental Surgery Degree. Supported by Isfahan University of Medical Sciences (Research Grant No. 185207). Bergman B. Disinfection of prosthodontic impression materials: A literature review. Int J Prosthodont 1989;2:537-42. Cottone JA, Molinari JA. Selection for dental practice of chemical disinfectants and sterilants for hepatitis and AIDS. Aust Dent J 1987;32:368-74. Egusa H, Watamoto T, Matsumoto T, Abe K, Kobayashi M, Akashi Y, et al. Clinical evaluation of the efficacy of removing microorganisms to disinfect patient-derived dental impressions. Int J Prosthodont 2008;21:531-8. Nassar U, Chow AK. Surface detail reproduction and effect of disinfectant and long-term storage on the dimensional stability of a novel vinyl polyether silicone impression material. J Prosthodont 2015;24:494-8. Nejatidanesh F, Khosravi Z, Goroohi H, Badrian H, Savabi O. Risk of contamination of different areas of dentist's face during dental practices. Int J Prev Med 2013;4:611-5. Al-Jabrah O, Al-Shumailan Y, Al-Rashdan M. Antimicrobial effect of 4 disinfectants on alginate, polyether, and polyvinyl siloxane impression materials. Int J Prosthodont 2007;20:299-307. Blair FM, Wassell RW. A survey of the methods of disinfection of dental impressions used in dental hospitals in the United Kingdom. Br Dent J 1996;180:369-75. Nejatidanesh F, Bagheri KP, Shahtousi M, Talaei M, Savabi O. Disinfection of polyether impression materials with hydrogen peroxide solution containing silver ion. J Isfahan Dent Sch 2010;5:181-8. Izadi A, Farnaz F, Soufiabadi S, Vafaee F, Kasraei S. Antibacterial effect of sanosil 2% and 6% and sodium hypochlorite 0.5% on impressions of irreversible hydrocolloid (Alginate) and condensational silicone (Speedex). Avicenna J Dent Res 2014;5:e21107. Dorner AR, Ferraz da Silva JM, Uemura ES, Borges AL, Fernandes Junior VB, Yamamoto EC. Effect of disinfection of irreversible hydrocolloid impression materials with 1% sodium hypochlorite on surface roughness and dimensional accuracy of dental stone casts. Eur J Gen Dent 2014;3:113. Muzaffar D, Braden M, Parker S, Patel MP. The effect of disinfecting solutions on the dimensional stability of dental alginate impression materials. Dent Mater 2012;28:749-55. McNeill MR, Coulter WA, Hussey DL. Disinfection of irreversible hydrocolloid impressions: A comparative study. Int J Prosthodont 1992;5:563-7. Sofou A, Larsen T, Fiehn NE, Owall B. Contamination level of alginate impressions arriving at a dental laboratory. Clin Oral Investig 2002;6:161-5. Ghahramanloo A, Sadeghian A, Sohrabi K, Bidi A. A microbiologic investigation following the disinfection of irreversible hydrocolloid materials using the spray method. J Calif Dent Assoc 2009;37:471-7. Azarpazhooh A, Limeback H. The application of ozone in dentistry: A systematic review of literature. J Dent 2008;36:104-16. Bocci V, Borrelli E, Travagli V, Zanardi I. The ozone paradox: Ozone is a strong oxidant as well as a medical drug. Med Res Rev 2009;29:646-82. Seidler V, Linetskiy I, Hubálková H, Stanková H, Smucler R, Mazánek J. Ozone and its usage in general medicine and dentistry. A review article. Prague Med Rep 2008;109:5-13. Nogales CG, Ferrari PH, Kantorovich EO, Lage-Marques JL. Ozone therapy in medicine and dentistry. J Contemp Dent Pract 2008;9:75-84. Arita M, Nagayoshi M, Fukuizumi T, Okinaga T, Masumi S, Morikawa M, et al. Microbicidal efficacy of ozonated water against Candida albicans adhering to acrylic denture plates. Oral Microbiol Immunol 2005;20:206-10. Anand SK, Ebenezar AV, Anand N, Mary AV, Mony B. A comparative analysis of antimicrobial property of wine and ozone with calcium hydroxide and chlorhexidine. J Clin Diagn Res 2015;9:ZC04-6. Wilczynska-Borawska M, Leszczynska K, Nowosielski C, Stokowska W. Ozone in dentistry: Microbiological effects of gas action depending on the method and the time of application using the ozonytron device. Experimental study. Ann Acad Med Stetin 2011;57:99-103. Lynch E. Comment on “The application of ozone in dentistry: A systematic review of the literature”. J Dent 2009;37:406-10. Baysan A, Lynch E. Clinical reversal of root caries using ozone: 6-month results. Am J Dent 2007;20:203-8. Estrela C, Estrela CR, Decurcio Dde A, Silva JA, Bammann LL. Antimicrobial potential of ozone in an ultrasonic cleaning system against Staphylococcus aureus. Braz Dent J 2006;17:134-8. Lynch E. Evidence-based caries reversal using ozone. J Esthet Restor Dent 2008;20:218-22.
al-Omari WM, Jones JC, Hart P. A microbiological investigation following the disinfection of alginate and addition cured silicone rubber impression materials. Eur J Prosthodont Restor Dent 1998;6:97-101. Rueggeberg FA, Beall FE, Kelly MT, Schuster GS. Sodium hypochlorite disinfection of irreversible hydrocolloid impression material. J Prosthet Dent 1992;67:628-31. Hiraguchi H, Iwasaki Y, Iwasaki E, Kikuchi H, Hirose H, Yoneyama T. Dimensional changes in stone models simulating full crown preparations with adjacent teeth resulting from long-term immersion of medium-viscosity addition-type silicone rubber impressions in disinfectant solutions. Dent Mater J 2015;34:48-53. Hiraguchi H, Kaketani M, Hirose H, Yoneyama T. Effect of immersion disinfection of alginate impressions in sodium hypochlorite solution on the dimensional changes of stone models. Dent Mater J 2012;31:280-6. Nejtidanesh F, Savabi O, Asgari SN, Shafie S. Dimensional accuracy of irreversible hydrocolloid impressions disinfected with ozonated water. J Isfahan Dent Sch 2012;8:18-26.